Disclosure: This post contains affiliate links. Please read my disclosure policy for more information. This post is not sponsored by any of the companies or programs discussed. I am using these companies as an example of how you can get started and go deeper with an affiliate program. I have been blogging for a year and a half. Time flies, I still feel like such a newbie! The past couple of months I have found myself imparting more knowledge in my blogging groups and via email than asking for guidance. Don’t get me wrong I still look to my fellow bloggers for advice, and I probably always will. However, I feel like I’m at a point where I can share some of what I have learned over this last year and a half with you. I am a DIY-er in every aspect of my life. I was never a big team player as a kid and still would rather just figure things out on my own. I have spent hours figuring out html and other nuances here on my blog. I could have easily hired someone to help me but the independent (stubborn) me just couldn’t do it. I have been researching and participating in affiliate programs this year and feel like I have a really good grasp on how to set them up and make money. I have had so much love and support from this blogging community, there is no way I would here still writing without it. I want to help others (you!) by sharing my experience to hopefully help your blog grow. So let’s get started. This post is all about the basics. Follow along this fall and we’ll get more in-depth. What is affiliate marketing? Affiliate marketing is a performance based program where a business rewards an affiliate (you) for a visitor or customer brought to the business’s website by the affiliate’s marketing efforts. Essentially you get paid to refer customers to a business. Most will pay you if a purchase is made, some will even pay if a customer just creates an account. There are many programs out there. There are entire companies that work to connect you to individual businesses. In this series I will refer to Amazon quite a bit, it happens to be my favorite affiliate program. I will also reference others that I use and am familiar with. Keep in mind there are so many more out there than just what I talk about here. Why participate? So you have a blog and love sharing your story with the world. All kinds of people are reading your blog and following you on social media. As your blog grows so does the amount of time you spend on it. Blogging can become a full time job (a fun one) but a job none the less. Why not get paid for what you do? If you are selective in which affiliate programs you use and careful in how you use them you can make money without overwhelming or worse yet losing your audience. Where do I find affiliate programs and how do I sign up? You can find affiliate programs a number of ways. The first is to join a large network like shareasale.com. Networks like this work directly with companies and allow you to choose which ones you want to work with. You have the benefit of logging into one platform and having companies at your fingertips to choose from. Through Share a Sale I have worked with Gymboree, Picmonkey, and Kiwicrate just to name a few. These are brands that I use was already talking about with my readers. It felt natural to incorporate affiliate links and be able to share great deals with my readers too. The other way to find a program is to look into the company directly. If there is a product or service you love and think your readers would love try scrolling to the bottom of their website and seeing if they have an “affiliate” link. Some of these links will direct you to a larger network (i.e. Share a sale or the like) and others will have their own program. I have been a big fan of Pick Your Plum for a while. Earlier this year I saw a link at the bottom of the site and signed up. They are very blogger friendly and carry all kinds of products I use in my projects and posts. It was a perfect fit. I will not post about or try to sell my readers a product or service that I do not use or believe in. Being a regular user of this site and their products makes my writing easier and keeps it genuine. I’m also a big fan of my hosting company ipage. They have great prices and very helpful customer support. I have used them for over a year and just this sumer found out they have an affiliate program. This is another eay sell for me because I truly like the company and am happy to refer fellow bloggers. If you do not immediately see an affiliate link try reaching out to the company via email or through a social media account. Just asking if they have a program could open up a dialogue to some kind of partnership. What does the FTC have to do with it? This is important, don’t scroll through without reading this part. If you participate in an affiliate program and share your links and ads with readers you must disclose that you may make money from these links. There are very specific ways to disclose this. The link below is the FTC guide for digital advertising. It was revamped last year and lays out examples of how and where to disclose on your blog and in social media. For example, the little sentence and link at the beginning of my post is a must in any post containing affiliate links. This is a fairly easy read and again a must before you start sharing affiliate links. There are the basics. What is affiliate marketing, how to sign up, and how to be FTC compliant. I urge you to take a look at some affiliate programs and find one, or a few, that fit your blog niche. 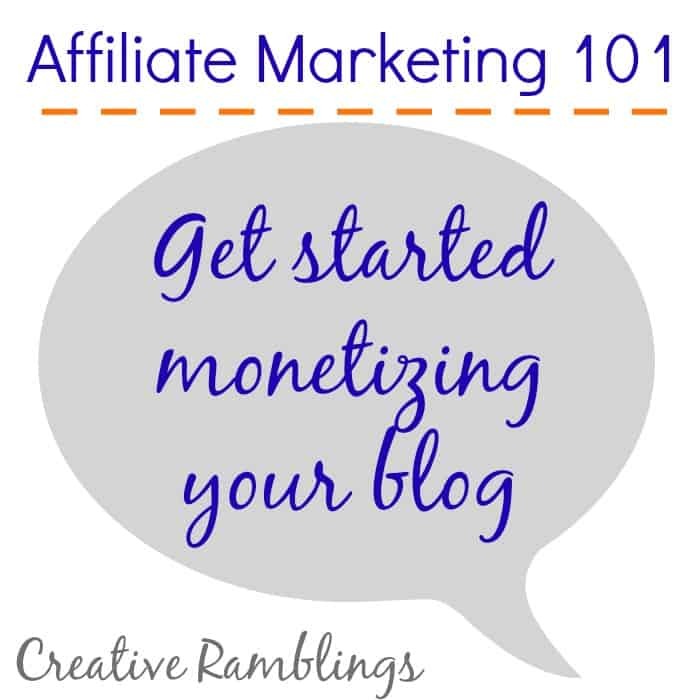 Next week I will share some examples and tutorials of How When and Where to use affiliate marketing effectively. Binfer has another great affiliate program. Wonderful, simple post to explain it blog money making! Loved the disclosure part! Thank you Sarah. I haven’t started working with affiliates and needed a little info. Great ideas. Pinning.